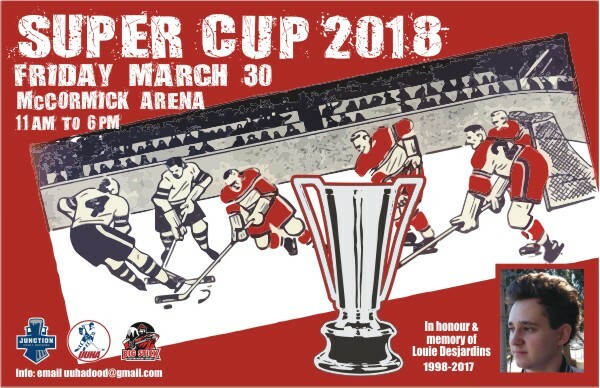 TORONTO - The 2018 edition of the annual Super Cup tournament is set to go for Friday, March 30 at McCormick Arena. Registration is now open to all UUHA members, friends and kin. This year's tournament will once again be played over the course of a single day (Good Friday) beginning at 11:00 AM and wrapping up at 6:00 PM and will feature a minimum of four mixed, skill-balanced teams. Each team will play a minimum of three games with the two top squads (following round-robin play) competing in the Super Cup Championship Final. Players will also have an opportunity to participate in the Super Skillz Competition and to rock the rink on the ice-adjacent Super Stage. Super Cup spots are limited so if you plan to participate please register ASAP. The tourney fee is $70, which includes a $10 charitable donation to the Portage Ontario Drug Addiction Rehabilitation Centre for Youth. We will also have access to McCormick's small ice pad all day for family-friendly pleasure skating, and the McCormick Park cafe (adjacent to the rink on the park side of the building) will be open and serving delicious food until at least 3:00 PM. 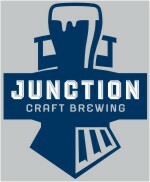 Super Cup beer sponsor Junction Craft Brewing will have product on hand for tournament participants, as well. As always, there will also be a post-tourney wind-up right after the Super Cup Championship Final at a licensed neighbourhood establishment (details forthcoming). To reserve your spot for the 2018 Super Cup email Chuck Molgat (molgat-at-gmail.com) stating your preferred position. Super Cup fees can be paid to your UUHA team GM or directly via eTransfer to Simon Evers (simonevers-at-rogers.com). Tournament fees are due by no later than Friday, March 16. "Louie voluntarily entered Portage Ontario Drug Addiction Rehabilitation Centre for Youth in October 2016 and successfully completed their six-month residency program. On his second day back home from Portage, Louie played defence for Team Impulse! and helped win the 2017 Super Cup Championship. Two months later Louie was killed. Portage had a meaningful impact on Louie's life and we wanted to celebrate that, and his history with the UUHA and the Super Cup in particular, by giving a donation in his name to Portage."